Okay! Musume Time: [12 Days of Idols] A Battle of Snow and Story, It's E-girls VS. GEM in The Single Showdown: 'Mr.Snowman' VS. 'Star Shine Story'. Who Shall Prevail...? [12 Days of Idols] A Battle of Snow and Story, It's E-girls VS. GEM in The Single Showdown: 'Mr.Snowman' VS. 'Star Shine Story'. Who Shall Prevail...? All thoughts and opinions within this post are totally, completely and inexplicably my very very own and no one else's. I swear, I did not steal these thoughts or ideas from the brains of others, because I am not an Idea Zombie. If I was, I would probably have better ideas. That said, please respect my opinion, no matter how idiotic or weird or opinionated it may be, and pipe down. Respect what is said, otherwise I won't respect you. Thanks~ Zombie Chiima, OUT! Christmas is nearing, Christmas is nearing! Can you hear those sleigh bells jingling? The sound of Santa-san's footsteps on the roof of your house, or the slight beating of the reindeer hooves as they gallop into the sky? What about the sounds of the Idols singing sweet Christmas tunes this year? It's so nice hearing all of the beautiful sounds that remind me of winter and Christmas, but when it comes to songs at this time of the year, it is really hard to choose just one to like the most. That said, I am a tad greedy and enjoy many songs, however if I were to narrow it down... Well, I would compare them! Because comparing is the way forward, clearly! And what better way to find a Christmas song I like better from a certain company, than to put them up against each other to see which one wins!? Actually, that's a great idea, because I really do like both songs! So let's try it, shall we? Maybe it will be Mr.Snowman, or will it be a Star Shine Story? Hm, I wonder which one I will choose...? Sometimes, you can't like one thing enough, and then other times you like too many things too much! So, what can you do about it? You pit them against each other! By *them*, I mean singles/songs. And so, because this Christmas is in abundance with awesome songs (some between the same agency) that I love and listen to constantly, I decided it would be fun to pit them against each other in review! Because that is how it should be, clearly! HAHA!!! I am going to flat-out admit that right now I am doing another single review only because currently, I am really tired and honestly cannot be bothered to screen caption and write out a full-on PV review in this state of mind right now. That said, I have also wanted to do this sort of review, a Single vs. Single review that is, for a few days and have played around with the idea in my mind a bit. So when it came to the point where I knew I couldn't hack a PV review (hence two single reviews in two days, though I didn't want two single reviews two days in a row...) I thought that I would implement the idea of a Single vs. Single review today and, who better than to throw into a battle against other here on my blog than two Avex groups releasing Christmas singles somewhere around the same time? What makes it even better is the fact that E-girls are supposed the more serious pop act under Avex, whereas GEM are clearly Idols. Of course we're also going to take the fact that they are both dance-heavy groups into matter, because even in a plain ol' single review, that counts for something. I mean, dance is a type of music too, and without dance music neither of these groups would be able to strut their stuff! So with that all said and done, let's get crackin' with this review and take a look into the Winter Wonderland that is E-girls' Mr.Snowman and the Christmas Fairytale of GEM's Star Shine Story. In a battle of music and general appeal, who will win? Let's find out! Mr.Snowman was one of the first Christmas songs I heard this year, back when I found it on youtube in November when I was randomly looking for updates, and the first time I heard this song I really did like it. In fact, it was one of my most looped songs for a bit, despite the fact that the version I listened to was the short music video that Avex generally throw to the fans to piss us all off. Still, it's a catchy song, and I was undoubtedly hooked on it. I still really like this song - it's fun and addictive, the tune playful and upbeat and the overall appeal of it is how quirky the song itself is with a perfect balance of Christmas and pop mixed in there. Honestly, I wouldn't say that this is the most 'Christmassy' song I have heard this year, because it's far more general pop than a typical Christmas song if you ask me, but Mr.Snowman does still hold elements within its composition that reminds me of Christmas, such as the slight sound of bells and some twinkling that is really effective, but not so out-there that it becomes tacky. In general, it's just a well-rounded Christmas pop tune that is easy to get into, and though it's not their best track, is a song that you could easily fall in love with if you're a Christmas song fiend like myself. On the other hand though, this does feel like a more generic-sound from E-girls. Though I do enjoy their generic sounds, because those are indeed my favourite from E-girls, I do like their dance tunes as well. Of course the music video for this features a heavy dance, however this song feels like it's too 'easy' for the group to pull off, giving it an Idol-like feel and making it a song I would probably expect from either SUPER☆GiRLS or some other Avex all-girl group, That said though, E-girls do pull off Mr.Snowman really well, and I do love the song. In terms of their vocal talent, I think they really made this song amazing, and I do enjoy the composition and arrangement of it all. Still, it feels like an easy song for E-girls, not matter how I hear it. If it had been a little more dance-centric in sound, I may have found it more complex, but it wasn't. No matter though, because it's still one of my favourite Christmas songs this year, and one of the most played. Honestly, what can I say about Star Shine Story that I haven't already said in my PV review for the music video? The song is catchy and has a beautiful Christmas-quality to it, albeit a recycled Christmas-quality we all know and love to loathe, tying in the sound of Fantasy and magic as well to create that uplifting, magical effect I like to hear in my Christmas tunes. It's a beautiful song, one with a really strong instrumental to back it up no less, and the vocals behind it are pretty fantastic as well. Though I do have a general gripe about really shrieky kids in this song (because seriously, the lead girl squeaks too damn high when she should just not sing) I do think that all of these girls have rather appealing vocals, so long as they know their limits... well, so long as Avex know the girls' limits, and I doubt that'll happen any time soon, but whatever. The vocals are still pretty nice, even when one goes too high at a time she shouldn't, and I like how all the girls sound so diverse in their vocals too, adding texture to the overall finish of the song. This sounds like an E-girls dance song, like, it really sounds like something E-girls would produce. 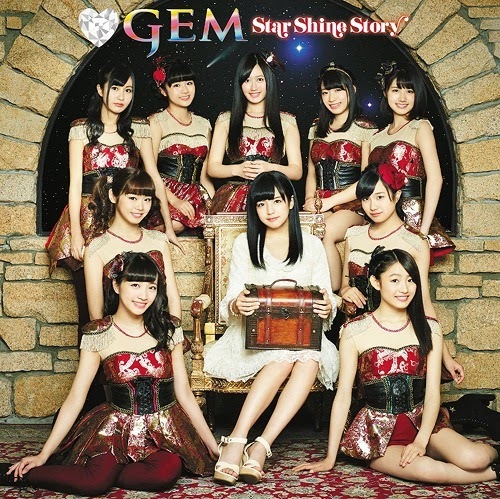 I don't know when I realised this, but at some point after listening to both Mr.Snowman and Star Shine Story together at random, I thought that GEM's own song sounded far too similar to something E-girls would do. Really, I could imaging E-girls prancing around to this (with better choreography, admittedly) as well as GEM, but the likeness is uncanny, and ever since realising that, I can't un-hear it; this is an E-girls song, and E-girls instead got the Idol song. Honestly, I really do enjoy both songs, however I do have to go with what my ears love the most and choose GEM's Star Shine Story. I'm a sucker for the typical Christmas songs, the ones that ring a familiar tune and have a nice little ditty to go along with it, but this song also the catchiest of the two with the most memorable beat and the nicest sound to it. I'm not saying that Mr.Snowman is bad in sound, because it isn't (I do love that song too, after all...) however Star Shine Story is stronger in sound and has a more colourful instrumental that really reflects the excitement and joy of Christmas, whilst also bringing about a fantasy-like quality that is very befitting of the Christmas season. 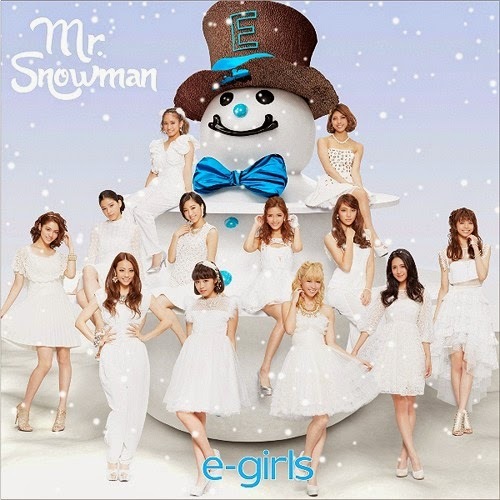 I do enjoy Mr.Snowman by E-girls, I really do, and I won't be stopping that song any time soon either because it's so addictive, but of the two A-sides, I have to say that GEM is the clear winner here. That song is far too addictive to be legal! Okay, time for the unfamiliar's in terms of songs, aka, the b-sides! Starting off once again is E-girls and, holy cow, this is what I'm talking about! Move It! is a wonderful club-dance song that sounds more up E-girls' alley and suits their style a little more. Already I hear a more mature, energetic vibe from them. Okay, Mr.Snowman is energetic and very warming to listen to, but I think that E-girls suit this scene a little more, a tune where you can really dance and basically just move along to when you hear it. Seriously, if this played in a club, I would dance along to it. It has a nice beat, the instrumental break sounds like it could have a really awesome dance break in the middle of it, and it feels like a song that I could become lost in the more I listen to or dance to it. Actually, Move It! sounds like the type of song I would have listened to when I was a lot younger (around the 13-14 age group, actually) back when disco/club/rave music was something I actively enjoyed, so hearing this really does appeal to me for the purpose of nostalgia, but even now it appeals to me as a young adult who generally does enjoy some dance and club music every now and again. It's a fun song, though my use of the term 'fun' is used in a more adult sense I suppose; I could see this song being used in a club-setting more than anything, and really, that's where I would like to hear it! It's a great mix and, whilst it isn't Christmas-like in any way shape or form, it definitely suits the image of E-girls well and is by far the best song of the two on the Mr.Snowman track list. Not to diss poor Mr.Snowman more, but honestly, the track is quite weak and this one is a lot stronger, and a lot more memorable. This, for me, is the E-girls I want to hear more of; fun in a mature way, and less of the Idol glamour veiling their pop tunes. They work better like this, in my opinion. I kinda wish there was a club somewhere close to me right now, actually... damnit. Okay, I admit that I had very little to no high hopes for this song at all when I decided to check out the b-side song to Star Shine Story because really, there is always one crap song on the track list at least, so given how great I found Star Shine Story, I had already pegged this as a song that would not be worth listening to. How wrong was I? Very. In fact, this was the song that hit the nail on the head and made me buy both Star Shine Story and Can't Stop Loving on itunes. Yeah, I like it that much, and I think it's a really good song! Others may beg to differ, but I rather like it. It's fun, upbeat, cheerful to the max, makes me feel uplifted and reminds me of happiness and smiles and everything sweet and fluffy. It's like an anime show tune in how active it sounds, and though I've only listened to it a few times already, I know that it's going to grow on me even more and become a favourite song of mine - I like my happy tunes, and this is a happy tune! I love the energy in this and that happy-go-lucky feeling the whole song gives me. Okay, so it's not giving me the chills like Fighting☆Hero does or breaking me out into tears in all of its glory, but it is a fantastic b-side all the same, and it makes me feel real happy and energized when I listen to it. I mean, I'm so damn tired right now to the point where all I think about is my bed, but putting this track on makes me want to write and write about how amazing it is, inspiring me to keep going until I've finished, and honestly, I love that in a song. I love it when a song inspires me to keep writing or to keep going. Actually, the lyrics seem to speak to me in a way, because part of the lyrics say 'Don't stop, don't stop going~', which is pretty encouraging. Huh, this song is a miracle worker! Sitting here listening to this, the more I take the song in the more I realise that, actually, this song reminds me of Cupitron's awesome Unicorn Parade, which I really do like. It has a sort-of-similar tune (not overly similar, but there are parts here and there that remind me of it slightly) and it has the same effect on me as Cupitron's debut song did. It's a nice tune, one that makes me feel happy and enlightened, and keeps me going when I needed a boost the most. For sure, this is a feel-good song, and yes; I really do dig it. I feel like I've spouted a load of crap because I'm so tired, and tomorrow I may look at this and cringe, then cry, then leave it be... because that's what I do. Okay, so this is harder to decide on because Move It! is the complete opposite to Can't Stop Loving, thus the comparisons are a lot harder to make when I think about the two songs and which I like better. With Mr.Snowman and Star Shine Story it was easy because, simply put, GEM had the better track and E-girls had the weak-link. If the songs had been reversed, I may have liked E-girls more, however despite the vocal talent of the senior group, GEM did get a stellar track that fit the Christmas bill a lot more than Mr.Snowman did. But we're not supposed to be talking about the A-sides, are we? No. We're going to talk about the B-sides, which I am currently battling myself over as I try to decide which is better because, clearly, I like both of these songs a great deal, and for different reasons; E-girls have a mature, fun sound that I really enjoy, one that reminds me of the sort of music I loved as a teenager and also shows how amazing they are vocally as a group, and then there's GEM who have this fun, happy-go-lucky tune that gives me energy and drive, a song that inspires me. Both of these songs, in their own amazing ways, are wonderful and appeal to me, just for different reasons - one gives me inspiration and drive, the other nostalgia and the desire to dance, and both give me energy. Going off of my feelings however (because I don't want to drag this on), I do think that Can't Stop Loving is the song that is my favourite of the two right now; it was a song that was unexpected in sound, and I really never anticipated liking it this much, but I do. It makes me feel happy and inspired, much like i☆RiS' Make It! actually, and it's a vibrant track that is just... well, great to listen to! I don't think that I could get sick of this song any time soon, because I really do like it, and if I had found or heard this sooner, I think that this could have become one of my most played songs of 2014. Given which groups' songs won both times around, GEM is my favoured of the two in this VS. match, however I do want to say that, whilst I have a preference in the form of Star Shine Story and its track list, I do also enjoy Mr.Snowman immensely as well, and listen to both the A-sides of these singles a great deal. Both are wonderful Christmas tunes, each with their own appeal, and after listening to the coupling tracks I have found two new favourite tunes as well, so no matter what, this is a win-win situation, if you ask me. Honestly though, looking at both soundtracks to see which I preferred has allowed me to take a better look at the sort of music these groups produce, and what they have to offer aside from the title songs I usually listen to in favour of the b-sides. With GEM, they are a group I barely listen to aside from the odd song that captures my attention, so to hear their b-side Can't Stop Loving has made me want to hear more from them, regardless of how I may dislike an A-side track. It's the same with E-girls, because even though I do listen to their songs a tad more than I do GEM, I don't listen to their b-sides enough either, so seeing that there is more to their songs than just a dull pop song or a sugary-sweet Idol-like tune makes me want to delve into their b-sides more and more, just to see if I unearth some Club gems that I would thoroughly enjoy, further hurling me back to the days where that was all I listened to, pretty much. Both singles have something about them that appeals to me, likewise there is something that could put me off; with E-girls, it's the fact that the song feels like it isn't catered strictly to their style, even if they do suit it, because it feels like they could do better, and with GEM it's that whilst I like their singers, some girls just seem to go overboard on their solo lines, so it gets a tad pitchy for me. That said, both singles are ones I would recommend others to, because they are great to listen to, and have a diverse sound that may appeal to different people. Overall, these are all great songs, and I think Avex have produced really decent or really great soundtracks this winter, with GEM being the greatest of the two. Let's hope that these girls, all of them, continue being awesome in the up-coming year. Which one is your favourite soundtrack? Let me know!